By Captain Nerd | February 23, 2015 - 1:59 am | February 23, 2015 anime things!, cool things!, cosplay things!, funny things!, Japan things!, neat things!, photo things! Decided to put the gallery here instead of on a page, that most people wouldn’t see. 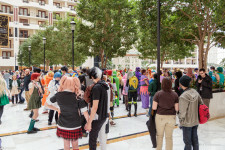 These are shots from Katsucon 2015, held February 13-15, at National Harbor outside of Washington DC. Enjoy!